Driverless pods sound like a thing of the distant future, but the first wave of autonomous shuttles are just around the corner. Better watch out, guys. The self-driving revolution has well and truly begun, and kicking things off is Wepod. The robot-controlled shuttle is hitting the Netherlands' public roads in November, making it the first driverless car to take to public roads without someone behind the wheel. 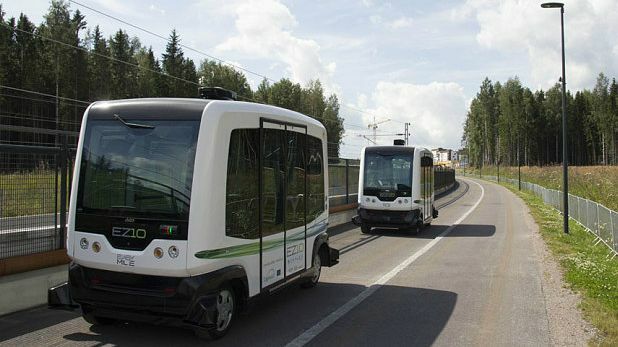 Self-driving buggies have been used outside the lab before, but they usually drive along dedicated tracks and don't get close to cars. Even the egg-shape ones we've seen from Google always have a driver present, which makes it harder to believe they actually crash. For now Wepod will operate between the two towns of Wageningen and Ede, but it is expected to expand to more routes and other regions in the Netherlands from May 2016 onwards. It sounds as though the service will work a bit like Uber. Residents summon one of the pods on their phone via an app, saying where they want to be picked up and dropped off, and then the vehicles do the rest. Wepod is the brainchild of researchers at Wageningen University, who will monitor the pods at all times from a control room. They also say it won't be risked during bad weather or rush hour. The Wepods are also capped at a speed of 25 kilometres-per-hour (that's 15.5mph), which gives drivers plenty of time to see it plodding down the road. The tech behind it all is a combination of GPS sensors and on-board cameras. More advanced self-driving cars are being trialled in the US by Google and various automakers, while Apple is also believed to be making its own.